As the novel progresses, we discover crime lord Isobel Satomi has also encountered Penny Royal, but her wish to have the power to tear her enemies apart has resulted in the black AI gradually transforming Satomi from a beautiful human woman to a hideous monster who’s only drive is to murder and eat not only her enemies, but anyone who gets in her way. A large cast of characters are brought into the story, and the main thing they have in common is that they are all being played like game pieces for Penny Royal’s amusement, or is it for her redemption? The first chapter, when Spear is initially awakened, reminded me of the old British cold war television shows, particularly The Prisoner (1967-68) starring the late Patrick McGoohan. This isn’t a bad thing, since I consider “The Prisoner” to be a brilliant television series, but the tone was different from the rest of the novel, which subsequently shifted into more space opera and military SciFi. Asher proved himself adept at making fictional science and technology seem practical and acceptable by the reader, but his aliens seemed to have almost all been derived from Earth creatures like crabs, snakes, and scorpions. 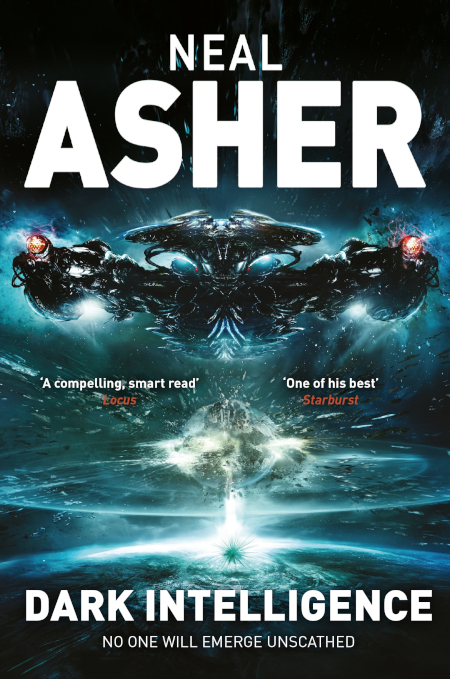 However, that may have been intentional on Asher’s part, since creating truly unique, non-human alien life forms that the reader can relate to is no easy task. Also, the forming of these creatures seems to have been deliberate in an attempt to terrify the enemies in a war that ended a hundred years past. As the result of this war, each side has their own “space,” and in between is a “no man’s land” called the Graveyard, where much of the action takes place. The novel inexorably leads everyone to the final confrontation on and around the planet Masada, and comes down to a terminal battle between Penny Royal and the now morphed and lethal “hooder” who was formerly Isobel Santomi. Or does it? I found Asher’s tying up of loose ends to have been logical and satisfying with one exception. What did Thorvald Spear get out of it, or does the reader have to continue with the next installment in the series to find out (or did I just miss something)? Note found in the public library’s copy of Asher’s novel “Dark Intelligence”. I had a lot of fun reading “Dark Intelligence,” and although it tended toward the “dark” and depressing, there was also plenty of high-octane action to hold my interest. The book isn’t an introspective message weighed down with social commentary, just spaceships, monsters, antimatter missiles, messily disposed of bodies, and good space opera fun. I recommend that you give it a whirl. 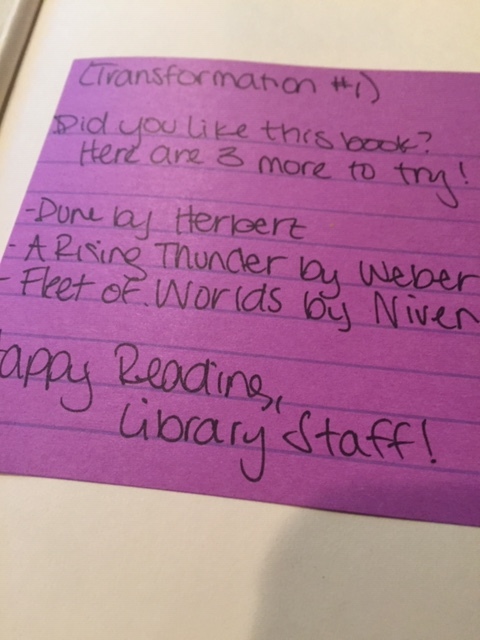 Oh, I found this book at my local public library (I love libraries) and inside the front cover, the library staff left a note that I found rather courteous. I’ve never read the Weber or Niven books, but I’m quite familiar with Frank Herbert’s Dune. Not sure I’d compare “Dune” to “Dark Intelligence,” but if I were Asher (and I’m not), I’d be flattered.